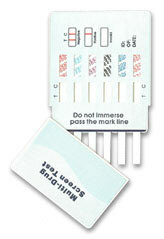 Urine drug testing is the most common type of drug test. Drug metabolites will appear in a urine sample long after they have disappeared from blood or saliva samples. Fat soluble drugs, such as THC (marijuana), benzodiazepines (Valium, Xanax, Ativan, Dalmane, Diazepam, Librium, Tranxene, Versed, Halcion, Paxipam, Restoril), phenobarbital, and anabolic steroids, slowly release their associated metabolites from fat cells for up to 30 days. These are the most difficult drugs to conceal while taking a urine test. Water-soluble drugs such as cocaine, methamphetamines, and opiates (heroin) are only stored in the body for three or four days. Therefore, it is easier to contain and conceal the metabolites for a urine drug test. The best way to prepare for a urine drug test, whether you use a detoxification product or not, is to increase your metabolism through intense exercise for a week or two before your test while drinking plenty of water. This will cause you to "burn fat", decreasing the size of fat cells which will cause the flushing of some or all of the toxins in your fat cells. Discontinue exercising forty-eight hours before your test to allow your urine to be clear of the impurities but continue to drink water to continue to rinse your system. If you are a heavy or long-term user, use a same-day detox drink or detox capsules 1 to 5 hours before your test. You will easily pass your urine drug test.